It may be proving easier to steal 121 auditoriums worth of digital cinema equipment than it is to actually hide or fence the stolen devices. Early Monday morning Brazilian law enforcement discovered a warehouse in Campo Grande, Brazil filled with some of the digital cinema equipment stolen from Quanta DGT in early February. The Delegacia Especializada de Combate ao Crime Organizado (DECO) or Special Delegation to Combat Organized Crime, had been investigating the crime since February 19th when the goods would have entered the state of Mato Grosso Do Sul. According to Ana Claudia Medina, the DECO delegate in charge of the investigation, suspicion centered on the warehouse located at 4466 Rua Filomena Segundo Nascimento, the main street in Jardim Itamaracá a section of Campo Grande, the state’s capitol. Search and arrest warrants were issued, before DECO moved in to search out the stolen goods, though no arrests were made. The owner of the warehouse where the equipment was found was unaware his facility was being used for criminal activity, having only recently signed a lease agreement with the alleged perpetrators. “He has testified and was discarded as a member of the gang,” said Medina of the warehouse owner. “Arrest warrants have already been ordered,” she added, though would not provide further details as the investigation is ongoing. Medina’s theory is likely correct. In mid-February, roughly 44 screens worth of digital cinema equipment turned up in the back of a semi-truck near Morro do Papagaio in Belo Horizonte, the capital of Minas Gerais, one of Brazil’s 26 states. In that particular instance the discovery of the stolen devices occurred by happenstance after police pulled the truck over during a routine traffic stop. The driver of the truck managed to elude captivity. The Campo Grande site is 1,300 kilometers away from the find in Belo Horizonte, at least 16 hours by car. It’s not much further to Quanta DGT’s facility in the Vigário Geral neighborhood of Rio de Janeiro where the digital cinema equipment was originally stolen. The value of all the stolen devices was estimated at BRL R$24.54 million (USD $9 million). Brazilian authorities examine digital cinema equipment stolen from Quanta DGT. 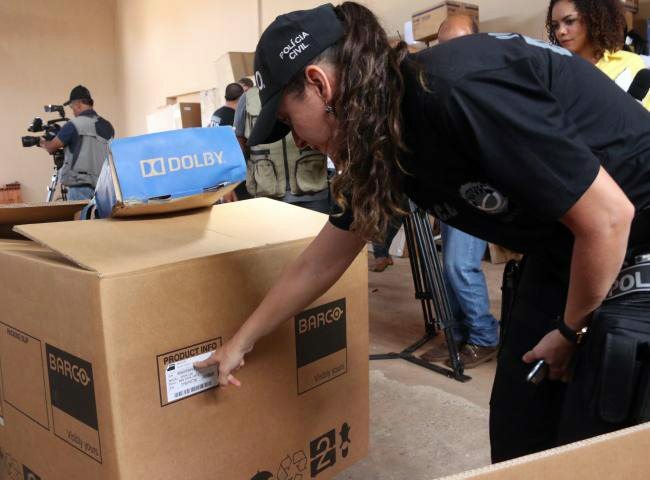 In one month’s time, Brazilian authorities have managed to recover more than half the digital cinema equipment originally stolen from Quanta DGT. Special thanks a tip of the hat to commenter Jester66 for tipping us off on this story.